These personal recollections of Lt Commander Carr, Group Commander of a flotilla of US Landing Craft Tank (Rocket), US LCT (R)s, during operations off Normandy and Southern France in the summer of 1944. His story starts with a brief aside concerning Pearl Harbour in 1941. On December 7th, 1941, I was a Storekeeper 3rd Class on the USS Antares, a stores issue ship returning from a mission south to Canton Island. We passed through the submarine nets at the entrance to Pearl Harbour at approximately 0625 and saw the conning tower of what we believed was a Japanese midget submarine. Since the Antares was unarmed we alerted the destroyer USS Ward, which was close by. The Ward depth charged the submarine and struck the first blow in the war with Japan. This action took place one and a half hours before the Japanese planes attacked at 0755 that morning. We proceeded into the harbour but soon reversed to clear the harbour entrance on realising the Japanese intention to sink us in the harbour mouth to entrap the ships anchored inside. In August 1942, we arrived in New Caledonia, where I was ordered to report to Columbia University in New York City for midshipman training. I completed the course in March 1943, commissioned an ensign and ordered to the Amphibious Base in Little Creek, Virginia for Landing Craft Tank (LCT) training. In September 1943, a ‘Special Support Group’ was established at the Little Creek amphibious base near Norfolk, Virginia with a nucleus of three officers, Lieutenant Commander Louis E Hart, Lieutenant D P G Cameron and myself, Lieutenant (jg) Larry W Carr, (jg = Junior Grade). We were to train crews for what became ‘Gunfire Support Craft’ during the initial assault phase of major amphibious beach landings. I became Group Commander of the 14 LCT (R)s that became part of that group with Lt D P G Cameron as my executive officer. In addition to these craft, we also provided for 9 Landing Craft (Flak) and 5 Landing Craft Gun (Large). All these craft would provide additional in-shore support and cover for the troop carrying landing craft. Our LCT (R)s were all British Mk3 LCT conversions, which were twice the size of the equivalent US Navy vessels. As our Command developed and expanded, in October 1943 we moved to Camp Bradford, Virginia. We were soon responsible for144 officers and 1537 men recruited from all branches of the US Navy, including small boat crews, midshipman schools, armed guard and boot camps. Training was provided in gunnery, fire-fighting, recognition, gas warfare and communications. 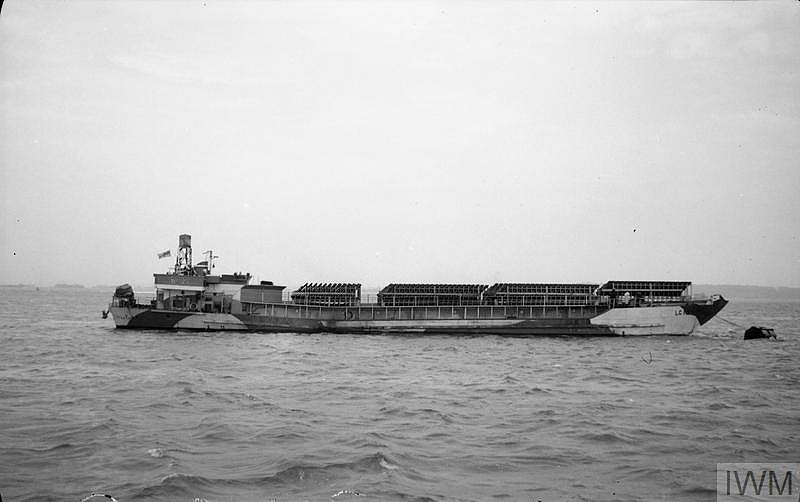 In addition, many officers and men practiced ship handling onboard LCTs. We were gaining knowledge and skills but we still required to organise crews and appoint commanding officers; it was a slow process. During late October 1943, we were on the move again, this time to Fargo Building, Boston, Massachusetts. As our duties and responsibilities intensified, both officers and men attended Price’s Neck, an anti-aircraft training centre on Rhode Island, for training on 20mm and 40mm guns. Recognition of German aircraft followed, while we waited to receive sailing orders for overseas duties. When these came, the men were organised into groups of twenty five and frequent musters were held to perfect the training we had received. Essential equipment arrived, including rifles, packs and foul weather gear and by November 20th, 1943, preparations were completed. We sailed for New York and on November 22nd, departed the city aboard the Queen Elizabeth bound for Scotland. We arrived at Roseneath on the 28th, known to us as US Navy European ‘Base II’. Our converted British LCTs would not arrive for several weeks, so a temporary operations base was set up to include maintenance and engineering units with associated training programmes in the technical aspects of the unfamiliar British equipment we were about to receive. These included gunnery, communications and engineering, particularly the Paxman-Ricardo diesel engine. Crews were also given further training in seamanship and the use of small arms. The LCT (R) group was organised on December 15th, 1943, as part of the ‘Special Support Group’, with myself, Lt. (jg) L W Carr appointed as group commander. Officers in charge of particular craft were assigned and their crews appointed. 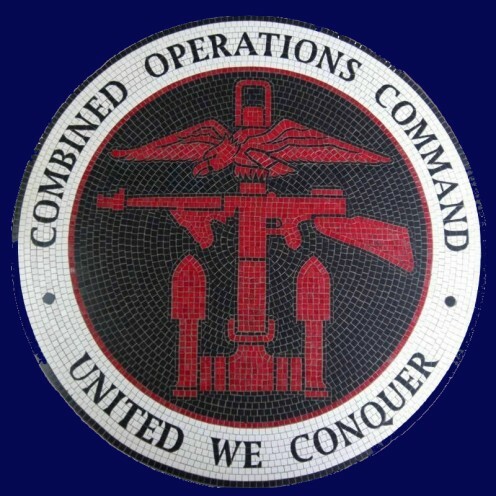 They were to become Division 1 of the LCT (R) Support Craft of Force "O" (Omaha) of the US Eleventh Amphibious Force. The staff consisted of: Ensign (Assistant Group Commander) D G Swallow; Ensign (Gunnery Officer) F D Michael; Ensign (Radar Officer) R W Bennison; Ensign (Engineering officer) W E Howard and Ensign (Communications Officer) E. Bernstein. In Portsmouth on December 20th, 1943, Mk3 LCT (R) 368 was the first craft assigned to our group. It was in poor condition having seen extensive service in the Mediterranean theatre as an LST before conversion to an LCTR. 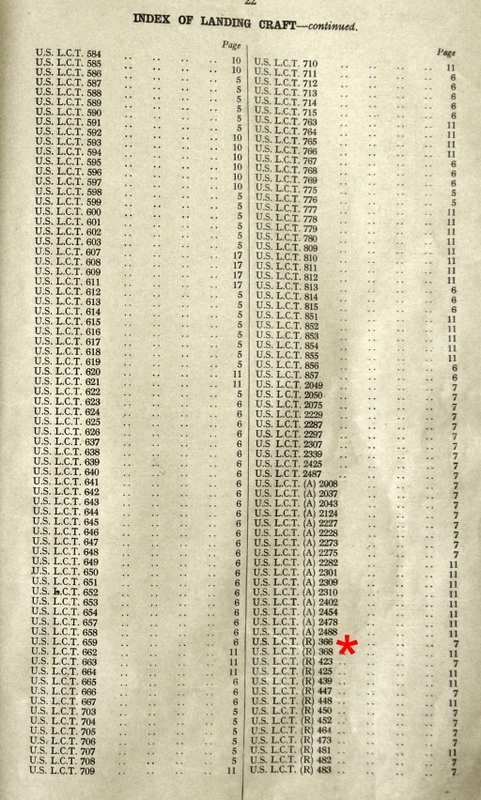 LCT (R) 366 followed a short time later under similar circumstances and by January, after much cleaning and repairing, the 366 and 368 commenced training with the British as part of the US Navy LCT (R) Group. Both attended an Assault Gunnery School at HMS Turtle near Poole in Dorset, England for live firing practice and the theory of LCT (R)s. Other officers in charge, assistant officers and key ratings, while awaiting the arrival of their own craft, completed similar training aboard the 366 and 368. Officers and selected ratings attended HMS Northney for radar training on British 970 and QH sets, while other officers trained on the Brown Gyro compass or continued training ashore at Base II. The slow rate of delivery of the craft was frustrating. I made numerous trips to see the Officer in Charge of Major Landing Craft at Troon, in Ayrshire and in Glasgow in an effort to expedite delivery. By the end of December 1943, the ‘Special Support Group’ became known as ‘Gunfire Support Group, 11th Amphibious Force’ under the overall command of Captain L S Sabin, USN, with me as executive officer or second in command. On February 6th, 1944, additional officers and men arrived from the United States, bringing the complement to over 2000 officers and men manning LCT (R), LCG (Landing Craft Gun) LCF (Landing Craft Flak) and LCP (L) (Landing Craft Personnel (Large)), which would be deployed as smoke-layers during the assault phase. The entire group was, effectively an experiment in a new type of naval warfare. The need for close inshore fire support for landing operations had been identified in past amphibious invasions, including the disastrous Dieppe Raid of August 1942. Heavy naval gunfire from cruisers, destroyers and battleships, while effective at direct and indirect targets often miles inland, could not provide the close quarter support once the infantry had landed. Converted landing craft with their shallow draught were able to provide support close into the landing beaches to fire on enemy positions. This close quarter support for landing troops was vitally important and the LCGs were aptly described by the BBC as 'mini battleships'. Each type of craft performed a specific function. LCT (R)s were designed to lay down an intensive barrage of 1000 + explosive rockets just prior to the initial assault waves landing, Flak craft were designed to cover the flanks and to give air protection, as well as giving fire support against machine gun nests on the beach, while Gunboats would fire on specific targets on the beaches prior to H-Hour. After H-Hour they gave close fire support against pill-boxes and other troublesome gun emplacements. A later addition to the group was the US Navy Mk5 LCT(A)’s or Landing Craft Tank (Armoured). Tony Chapman of the LST and Landing craft Association adds; The Mk5 LCT were American built tank landing craft. They began arriving in England during 1942 and later many were carried in whole or part by USLSTs and dropped off in England to be assembled or crewed. Prior to D-Day, close to 160 had served with the Royal Navy under Lend-Lease and were dispersed amongst numerous LCT flotillas. To separate them from their American sister Mk5 LCT, the British craft had a 2 added in front of their original US Navy pennant number, thus, British Mk5 LCTs carried pennant numbers in the 2000 series. At various times 48 LCTs were converted for specialist duties and re-designated LCT (A) (Armoured), LCT (HE) (High Explosive) and LCT (CB) (Concrete Buster). The LCT (A)s were fitted with a firing platform to the fore of the tank deck, allowing the tanks carried in the first assault waves to fire over the LCT (A)'s bows as they approach the landing beach. In addition to the firing platform or ramp, the LCT (A)s carried increased armour plate to the bows, bridge and wheelhouse sections. Having landed, the tanks continued to give close fire support on the beach. Prior to D-Day, some 26 LCT (A) conversions were lent back to the US Navy under ‘Reverse Lend-Lease’. It was these craft that became part of the Gunfire Support Group 11th Amphibious Force. On the morning of D-Day, distributed across Omaha and Utah beaches, the landing craft assigned to Omaha delivered the tanks of the 743rd Tank Battalion, while the craft assigned to Utah delivered the men of the 70th Tank Battalion. All the tanks carried in by the two groups having the capacity to fire afloat. The LCT(A) (HE) assigned to the groups were as follows: Utah beach Tare Green sector - 2310, 2402, 2454, 2478; Uncle Red sector:- 2488, 2282, 2301, 2309. 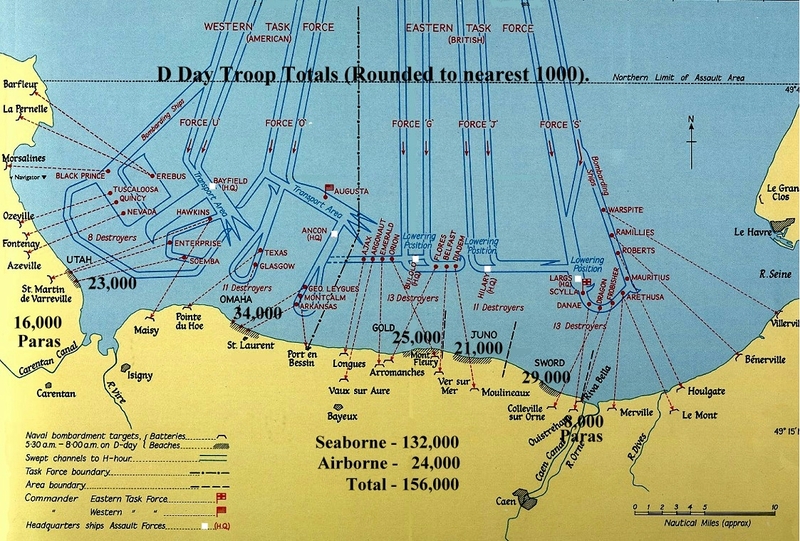 Omaha beach: Dog Green sector:- 2227, 2273; Dog White sector:- 2050, 2276; Dog Red sector:- 2124, 2229; Easy Green sector:- 2075, 2307; Easy Red sector:- 2049, 2287, 2425, 2339 and Fox Green sector:- 2008, 2037, 2228, 2043. Craft shown in blue are listed as War Losses in the assault area. Each LCT (R) was designed to deliver hundreds of 5 inch diameter explosive rockets on to the landing beaches just before the first assault troops were due to land. The rockets had the capacity to saturate an area around 700 yards wide by 300 yards deep to destroy enemy beach defences including mines. Careful handling and preparation, accurate navigation and precise timing were vital to avoid hitting the assault troops on their final approach to the landing beaches. The two craft that fired during the ‘Duck II’ demonstration exercises created a great impression, although one released her rockets far too early. Nonetheless, they proved to the American observers that the rocket was a weapon which could pulverise a sector of beach in the final few seconds before troops went ashore. The proximity of our own troops approaching the beaches elevated the timing of a rocket barrage to the highest importance. Experience proved that rockets could be safely fired when the leading assault wave was some 700 yards from the beach or the point of impact of the rocket pattern. There were differences between the British and American use of the LCT (R)s off Normandy. The British fired at H-Hour minus 10 minutes while the American LCTRs fired at H-Hour minus 2 minutes at targets slightly inland. The LCT (R)s were converted British Mk3 LCTs with a maximum length of 192 feet and 31 feet across the beam. The standard power unit comprised two Paxman Ricardo diesel engines giving a maximum speed of 9 knots, with both screws turning to starboard (right). An extra deck was constructed over the tank space, on which either 972 or 1044 5" rocket projectiles launchers were welded. The original design anticipated re-conversion of the craft, so the crew's quarters, officers' quarters and magazines were separated by canvas bulkheads. In order to make the US craft more comfortable and secure, the canvas was replaced by steel or wood by their own crews. Home comforts included bunks and hot water heaters. The craft were equipped with 970 Radar, a British set which swept 360 degrees in azimuth once a second. Its maximum range was 25 miles with three and a half and seven mile range scales. Whilst the primary use of the Radar was to accurately determine where to fire the rockets, it proved to be a valuable navigation aid. 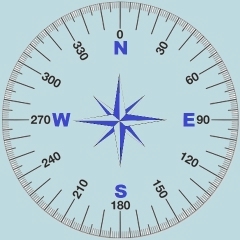 Each craft was also equipped with QH, a navigational aid and a Brown gyro compass. The 5" rockets were fired electronically by a series of switches in the wheelhouse. Each switch would fire either 39 or 42 rockets per salvo, depending on the total number mounted. One group of 36 rockets was wired separately to provide twelve salvos of three rockets each for the purpose of ranging. All the projector tubes were mounted at a 45 degree angle to the waterline and all pointed forward. The target area was covered by pointing the craft’s head at the target, determining the range by radar and/or ranging salvos. The firing of salvos, with a pre-determined short time interval between them, gained the desired depth of pattern. The width of the pattern was 700 yards and could not be adjusted. The depth of a complete broadside of 24 salvos could be achieved within the range of 300 to 1000 yards, or even more, if required. A round consisted of three partitions, the fuse, projectile and propelling unit. A complete assembled high explosive round was three feet in length and weighed 59 pounds, 7 pounds of which was poured high explosive (TNT and Emitol). The range of a high explosive round was 3580 yards. Incendiary rockets with a range of 3900 yards were provided for ranging. Smoke rockets were also available. The LCT (R) had several deficiencies. Extreme accuracy in navigation and a very steady course was essential during a firing run. Rudders were very small and the rocket racks increased the free board making the craft more difficult to manoeuvre in the wind. ‘Aiming the ship’ was the only way to line up the rockets with the intended target and more manoeuvrability would have been desirable. The LCT (R)s, nevertheless, proved to be an effective weapon. On March 20th, 1944, at Base II, two more rocket ships, Mk3 LCT (R)s 447 and 448 were assigned to the US Navy. In brief ceremonies, the British flag came down to be replaced by the American Ensign. 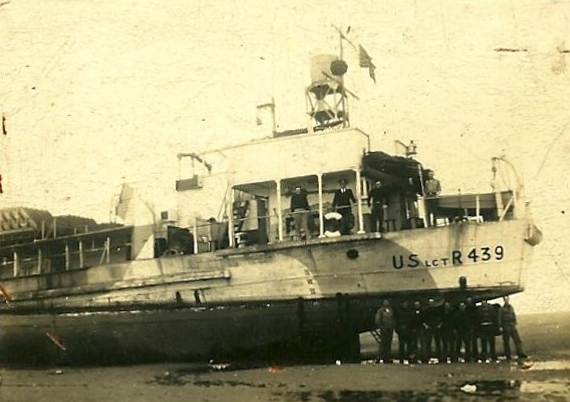 On April 2nd, 1944, LCT (R) 425 joined the group and the following day the craft formed a convoy south to their permanent base at Dartmouth, England. 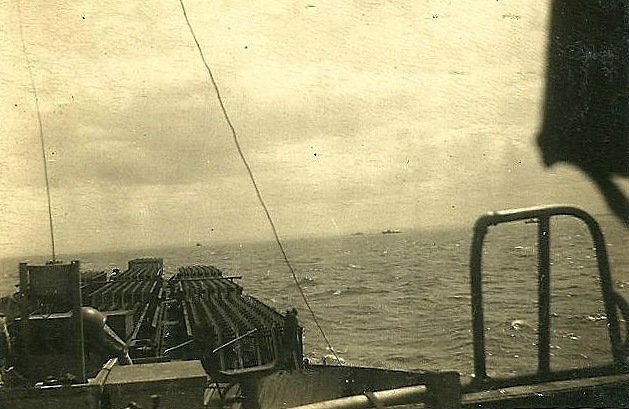 I was in command of the convoy, which consisted of three LCT (R)s, two LCFs and three LCGs. The route took us from Roseneath by Stranraer, Douglas on the Isle of Man, then down the Irish Sea to Appledore in Devon. Once around Land’s End, we headed east to Falmouth and Dartmouth. The 500 mile trip took five days and was punctuated with many difficulties, including engine trouble, chronic sea-sickness and radio and radar problems. Maintenance was the most difficult problem to hand. Without major overhauls there would be no lasting improvement in the position. The craft were British LCTs fitted with British equipment and parts, which were difficult to obtain under the elaborate and bureaucratic system of the Reverse Lend-Lease scheme. The maintenance staff worked day and night when material became available, although technical equipment such as radios and Radar, continued to be problematical. Staff offices were located in the Royal Naval College at Dartmouth around April 3rd, 1944. My LCT (R) group, at that time, comprised five craft with the remainder still to be delivered. Fortunately, their crews were already at Base II, in Scotland. After repairs, 425, 447 and 448 sailed to Poole for the Assault Gunnery School course. On April 15th, 1944, the LCT (R) office was moved from Dartmouth Naval College to Hunter’s Lodge on the River Dart. Moorings for our craft were assigned close by. During April, the 366 and 368 took part in the ill-fated ‘Exercise Tiger’. Unfortunately they were not allowed to fire on the beaches, because isolated units of the first wave landed an hour before H-Hour due to a communications failure. Later that month, 366, 368, 425, 447 and 448 took part in exercise ‘ Fabius 1.’ The first wave consisted of LCT (A)s and LCTs carrying DD tanks (Sherman Duplex Drive tanks, swimming tanks). The original plan was that the LCT (R)s were to open fire when this wave was 300 yards from the shore but this was later deemed to be too close for safety. Some difficulty was experienced in navigating through the transport area to the correct firing position. LCT (R) 425 became lost in the transport area and did not open fire at all and 447 failed to reach the transport area. However, the three remaining craft successfully fired their volleys and demonstrated once again the effectiveness of the rocket fire, which completely obliterated their theoretical targets. On May 6th,1944, LCT (R)s 423, 450, 452 and 464 arrived in Dartmouth. These craft were much newer and required much less maintenance, although radar and radios were still a problem. They immediately embarked upon a number of exercises to bring the crew and craft up to operational standard with a series of firing exercises on the Slapton Sands assault area. The British gunnery school at Poole was, by then, closed but these training exercises, which we undertook on our own initiative, proved beneficial. Emphasis was placed on timing and accurate ranging using test salvos and radar. On May 17th, 1944, LCT (R)s 439, 473 and 482 arrived in Dartmouth. We were still missing 481 and 483. Training continued throughout May and every craft was given a complete operational check. There was a noticeable increase in activity and intuitively we knew that D-Day was at hand. Our skills were fine tuned with daily firing runs into mock enemy beaches. Two sets of rockets were loaded onto each craft - one for the racks and the other for the magazine. Other materials were taken aboard and detailed logistics and intelligence plans were received. All sorts of publications about our mission were distributed. It was now glaringly obvious that the invasion date was near. Our craft were assigned to two forces, 366, 423, 483, 447, 450, 452, 464, 473 and 482 were assigned to ‘Force Oboe’ under Rear Admiral Hall and 368, 425, 439, 448 and 481 were assigned to ‘Force Uncle’ under Rear Admiral Moon. Late in May, ‘Third’ officers were assigned to each of the craft. Those officers who had served with gunfire support craft in other capacities were sent to radar school and joined the LCTRs primarily as radar officers. However, most of their duties were on deck but they all proved to be a valuable addition to the efficiency of the group. The allocation of the ‘Third’ officers to their craft was as follows; Ensign F D Michael to 439, Ensign R E Worthen to 366, Lt (jg) R W Bennison to 368, Ensign R L Palmer to 423, Ensign R M Costello to 425, Ensign G D Soule to 447, Ensign G L Hershman to 448, Ensign D G Swallow to 450, Ensign J C Cavness to 452, Ensign C H Easley to 464, Ensign G P Sherman to 473, Ensign P T Wilson to 481, Ensign J J Lassiter to 482 and Ensign S S Rough to 483. Ensign Michael and Lt (jg) Bennison went aboard the 439 and 368 for temporary duty. During the last week of May, all craft in Force 'Oboe' were ordered to Poole and the craft of Force 'Uncle' to Salcombe to prepare for the invasion. LCT (R)s 481 and 483 arrived loaded and ready to go at their respective ports of embarkation on June 1st. The crews of both craft had passed through gunnery school on other craft but they did not fire a rocket from their own craft until the invasion. On June 3rd, all LCT (R) personnel were briefed on their role in the coming invasion. Maps of our landing beaches were issued, landmarks and targets identified and intelligence reports issued, all set within the wider context of the task ahead. It was especially important that the LCT (R) officers familiarised themselves with the terrain, landscape and landmarks of the beach to accurately pin point their target. As an aid, a PPI screen prediction was added to the radar devices, which they could compare with the live PPI screen display as they approached their landing beach. When the two images matched they were ‘on target’. Frequent briefings and further study of the meticulous and detailed plans followed. At 0300 hours on the morning of June 4th, 1944, after a final briefing to my men, the craft of Force 'Oboe' sailed in convoy for France. The craft of Force 'Uncle' had sailed at 1600 hours on the afternoon of June 3rd, however, the weather had deteriorated and all ships were ordered back to their starting points. The LCT (R)s of ‘Oboe’ had LCMs in tow carrying demolition units and these greatly hampered ship handling. The ‘Uncle’ LCT (R)s had LCP (L)s in tow. The craft for the ‘Oboe’ convoy returned to Poole and the craft of the ‘Uncle’ convoy put into Portland. The weather had improved a little when the convoys got underway for the 2nd time on June 5th and headed for Normandy. Manoeuvering the unwieldy gunfire support craft was very difficult in the rough waters of the English Channel. At approximately 0500 hours on the morning of June 6th, 1944, the convoys arrived at their respective transport areas, where the tows were detached. 425 had fouled her screws and was assisted down the mine swept lanes in convoy towards the line of departure. This was the starting point for our final approach to our designated beaches and at approximately 10,000 yards offshore the LCT (R)s formed up line abreast and began their run for the beach. H-Hour was set at 0630 hours. Officers believe they fired on target in all instances. Time taken to reload varied between between 9 and 19 hours. The difference was accounted for by random events, including the loss of anchors, rockets stuck in boxes and large numbers of misfires requiring the removal of the projectiles. The 970 Radar and the PPI Predictions were deemed successful by all craft. All craft fired 'ranging salvos' but poor visibility prevented accurate calculation of their points of impact. With the exception of LCT R) 366, ranging salvos were used only to ‘check’ the accuracy of the radar. The extremely shallow water in the vicinity of several beaches added to the difficulty in ranging salvos, because the rockets could easily have exploded short of the beach in the water, giving the impression they had reached the beach. All craft, with the exception of the 366, therefore, fired by radar at the pre-determined range. Firing positions were calculated with reference to landmarks and fixes, obtained in some instances by QH and in others by 970. There were no casualties to either the craft or the personnel and no craft fired a second load of rockets. On June 9th, ‘Oboe’ LCT (R)s returned to Poole and on June 12th, ‘Uncle’ LCT (R)s returned to Portland. The US Navy LCT (R) Group had fired 12,605 rounds of high explosive ammunition and 326 rounds of incendiary on to the beaches of Normandy. Their mission was considered a success. After a week in the 'return convoy' ports, the LTC (R) group returned to Dartmouth. There were no orders, so we took the opportunity to carry out routine maintenance repairs. On June 29th, 1944, orders came to prepare nine craft for operations in the Mediterranean area. All nine craft were painted American Battleship Grey, the engine tops were overhauled, new American TCS radios were installed and radars were checked and repaired as required. Provisions were taken on board and the fire fighting equipment greatly improved. Because US bases did not carry spares for our British LCT (R)s, we stocked up with more spares than usual. Time was tight but, with close co-operation and coordination between the base and the craft, work progressed apace, including dry dock repairs to damaged hulls. Ensigns C H Lockwood and B T Geckler joined the group as ‘Third’ officers on 439 and 368. The entire staff moved aboard and we were ready to sail. The intense effort had taken just one week. On July 7th, 1944, our group sailed to Plymouth to join ten British manned LCT (R)s for the passage to the Mediterranean and 4 days later the commanding officers were briefed on the convoy. It comprised the combined British and US Navy LCT (R)s, two destroyers and five tugs. After the briefing, Admiral J L Hall addressed the US LCT (R) officers in charge. He expressed gratitude for a job well done off the Normandy beaches, being aware of the many difficulties and problems experienced. He requested the officers in charge to convey his appreciation to the officers and men. On July 12th, the convoy set off for Gibraltar and the trip was comparatively uneventful. There were submarine alerts but no signs of enemy aircraft. Gibraltar was sighted on July 20th and new orders were received for the USLCT (R)s to continue to Oran, where we arrived on July 21st thus completing the longest non-stop trip ever attempted by such craft. The British elements remained in Gibraltar. The craft functioned surprisingly well, although two suffered air locks in their fuel supply lines and were taken under tow until repairs could be made. Of the 24 craft, only four required a tow at any time and we completed the10 day trip at an average speed of seven and a half knots, made possible by favourable weather and sea conditions. On July 23rd, we set off for Bizerte without tugs or escorts. LCT (R)s 366 and 450 broke down one day out and they returned to Oran under tow, while the rest of the convoy continued for Bizerte with 473 taken under tow at some point, when one of her two main engines broke down. There was a heavy sea on the night of July 25th, so the convoy resorted to tacking for twelve hours to keep the craft more stable. All twelve craft arrived in Bizerte Road at 2300 hours on July 28th, 1944 and entered Bizerte Harbour on July 29th, in need of extensive repairs. However, before major overhauls could be carried out, the most serviceable craft sailed to Naples between the 1st and 5th August with others following on in small groups as they became operational. LCT (R)s 366 and 450 arrived in Bizerte on August 3rd, by which time 366 needed two new engines and the 450’s ballast tanks were leaking into her fuel tanks. In Naples, the briefings for the new campaign began with little time for thorough scrutiny of the plans. However, our previous experience off Normandy made the process easier to understand. The craft had sailed without their complement of rockets for damage control reasons but supplies, thought to have been in Naples, fell short of our requirements. LCT (R)s 366, 450, 481 and 423 sailed to the Pozzuoli staging area on August 9th unloaded. The 366 had two new engines installed and the 450 had filled her ballast tanks with fuel oil to make the trip. All craft arrived at the Pozzuoli staging area in operational condition. 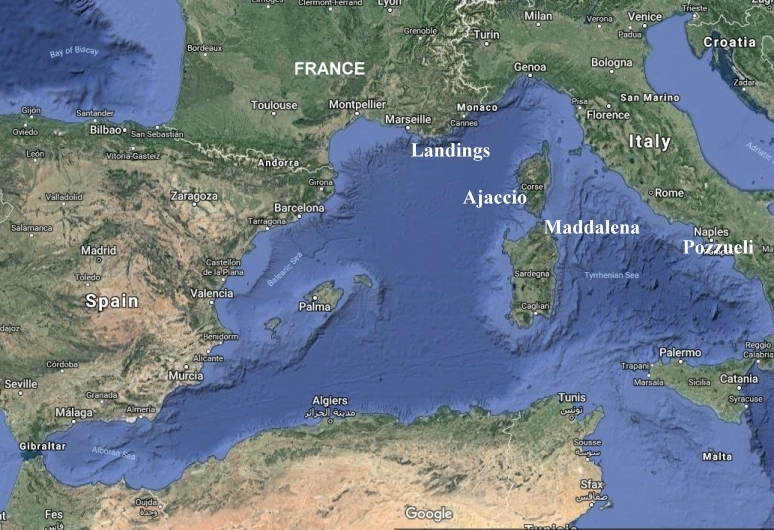 En route to Ajaccio, 366, 423, 450 and 481 left the convoy for Maddalena to load. Fuses needed by other craft were flown to Ajaccio and all the craft left Ajaccio loaded and in operational order. At 1930 hours on the evening of August 13th, 1944, the first assault convoy got underway for France. The weather for the entire trip was favourable and the movement plan was accomplished, although the convoy speed of 4-5 knots was too slow for our flat bottomed craft to keep good station. LCT (R)s 366 and 425 were assigned to Blue Beach and on Green Beach 368, 423, 447, 452, 482 and 483 were assigned to the original assault in the Camel area. 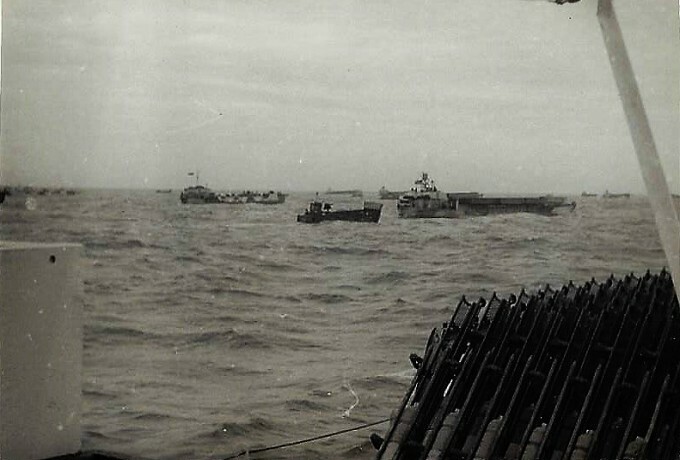 LCT (R)s 439, 448, 450, 464, 473 and 481 were assigned to Red Beach for the Z hour assault. They were joined by the reloaded LCTR 425 and a number of British craft. The craft on Blue Beach reported no opposition. Lieutenant J C Cohen USNR, commanding 366, fired at H-5 minutes to cover a ‘rather slow first wave’. Lieutenant (jg) R E Ellicker, commanding 425, fired at approximately the same time. Both craft believed themselves on target although haze and dust on the beaches made a positive sighting impossible. Superficial damage and fires were caused aboard both craft by the intense heat of the propelling charge. The six craft on Green Beach fired approximately as scheduled. Reports indicated that 447 of Lt W L Quest fired at H-9 minutes, 452 of Lt W B McCown fired at H-6 minutes, 423 of Lt (jg) W S Caldwell fired at H-5 minutes, 483 of Lt (jg) R H Tucker fired at H-5 minutes and finally Lt G A Karlsen, commanding the 368, fired at H-Hour. The 368 was on the flank but did not fire over the troops. Sporadic enemy gunfire was observed but all fell short of the craft. The radar on 447 stopped working by H-1 hour and she was forced to rely on ranging salvos, which were difficult to observe on a hazy beach. The 482 reported strips of light metal resembling tinfoil falling from the sky, which fogged the PPI picture but the problem cleared up before firing. The remainder of the craft recorded no problems. The beaches were again obscured by the pre-H-Hour bombardment and the precise impact locations could not be confirmed from the firing range. Craft in the boat lanes experienced difficulty in standing clear of the second wave. The craft assigned to Red Beach formed up and proceeded to the line of departure in order to carry out the Z Hour assault at 1400 hours. Once there, they stood by for approximately one hour between 1345-1445, awaiting the completion of an unsuccessful attempt to destroy obstacles on the beach by Apex boats. During this time, they were subjected to sporadic gunfire, which came extremely close. However, all the projectiles fell short, suggesting that the shore batteries were firing at their extreme range. Shrapnel fell on the decks of all the craft involved and Seaman Richard Charles Syers, serving with LCTR 439, was hit by a nearby burst at about 1430 hours. He was the only casualty in the group. Upon receipt of the order to proceed to Green Beach, the LCT (R)s returned to the transport area and stood by. At about 1430 hours on D+1, all LCT (R)s received orders from LCH 240 (Landing Craft Headquarters 240) for onward routing and at about 1630, the craft sailed in a nine knot convoy, for Ajaccio. However, after 7 hours, they were all ordered to return to Red Beach, because an escorting vessel had become detached during the night. By the time the craft set off for a second time, both 448 and 452 had problems with one of their engines and were taken under tow. All craft arrived safely in Ajaccio on August 19th. The LCTRs remained for a day and then sailed for Bizerte, arriving there on September 1st. At Bizerte, repairs were undertaken and all craft were repainted. 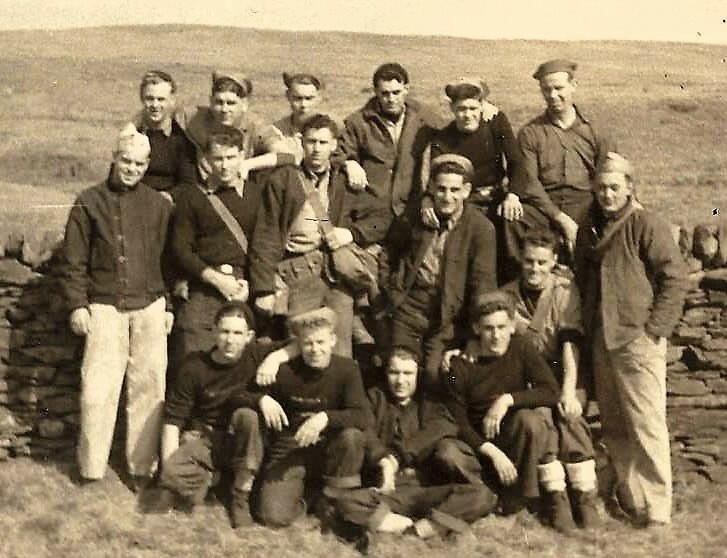 They were not returned to England as expected for transfer back to the Royal Navy, instead they were transferred to the British base at Messina and all US Navy personnel repatriated. On October 4th, 1944, all the LCT (R)s were returned to the Royal Navy. Following the return of our craft back to the Royal Navy, my officers and men returned to America by ship. I flew back to Washington for a new assignment, where the Bureau of Naval Personnel appointed me to set up a training programme for crews of the new LSM (R) rocket ships being built for the US Navy. All of my former officers and crews were ordered back to Little Creek for training. I was later assigned as Flag Lieutenant to Admiral Lowrey in San Diego, who was to command the amphibious forces for the invasion of Japan. The end of the war in 1945 resulted in my being returned to inactive duty on September 14th 1945. The use of British rocket craft proved of great value to the US Navy. In no small measure, they made a significant contribution, furnishing support for our troops landing both in Normandy and in Southern France. The job of recruiting and training personnel for our British rocket ships and the development of the associated administrative organisation was challenging, as inexperienced personnel worked in unfamiliar craft within a limited time. It required close co-operation between the groups and their British counterparts. With the successful completion of its missions, the LCT (R) group, the first of its type in the US Navy, considered its task was well done. Pearl Harbour. 1941. He was on the first US Navy vessel that witnessed a Japanese midget submarine in Pearl Harbour and later the attack on December 7th, 1941. D-Day-Normandy. June 6th. 1944. Group Commander of all US Navy Rocket Ships (LCTRs) to fire on to the beaches just 300 yards ahead of the first assault wave. D-Day Southern France. August 1944. Still Group Commander of all LCTRs to fire ahead of the first assault wave. LSMR Programme. First US Naval Officer attached to a new programme to train men in the use of a new generation of rocket ships built for the invasion of Japan. My late uncle, Charles R. Murphy served aboard the US LCT (R) 483 at the time of the Normandy Invasion, etc. Briefly his story is as follows. 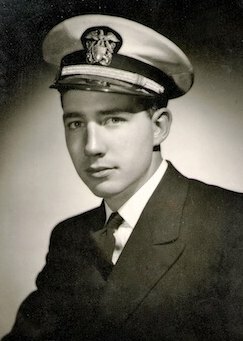 He enlisted in the Navy on June 17, 1943, but he "misstated" his actual date of birth as June 16, 1926 instead of the actual date of June 16, 1927. 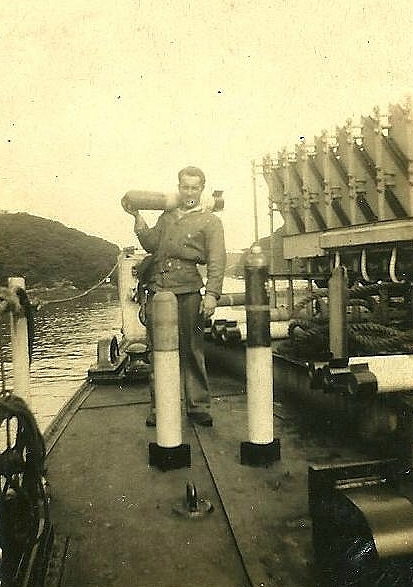 After boot camp, he attended electricians school and then assigned to the USS LCT (R) 483 just in time for D Day. In other words, he was 16 years of age at the time the ship was off Omaha Beach. He told me that an interesting aspect of his time on the ship was that they had not fired their rockets before D Day itself and they had to move in close to the beach to fire the rockets, then he saw the Army troops being ferried toward the beach as they withdrew from the area. After the LCT's were turned back over to the British Navy, he was assigned to the USS Clarion River [LSM (R) 409], rode it to the Pacific theatre and was aboard this ship when the war ended. At the time, he was an Electrician's Mate 3rd Class. After the war, he knocked around the San Diego area for a while, then joined the Army just in time to be sent to Korea where his outfit, the 163rd Artillery, was over-run by North Koreans. He was reassigned to Pusan in the Quartermaster Corps and decided to stay in the Army. He served in Germany, two tours in Vietnam (where he was awarded the Bronze Star), etc. and retired as a Sergeant-Major. He died on May 17, 2017 in North Little Rock, AR. He will be buried with full military honors on June 16, 2017 on what would have been his 90th birthday. As an aside, I have the flag of the US LCT (R) 483 that was flying on D Day. As he related to me, sometime after D Day, due to the storms and the smoke, etc. from the rockets, the flag had become tattered and was being replaced. He asked the Captain for the flag and he sent it home to a sister, who kept if for years, then returning it to my uncle, who gave it to me this past year. I have it "framed" in my office in a flag case....indeed, it is stained and tattered. He had an interesting life and never tired of telling stories from his time in the Navy and the LCT (R) 483 in particular. These personal recollections of Lt Commander Carr concentrate on the use of US Landing Craft Tank (Rocket) off Omaha, Utah and Southern France. 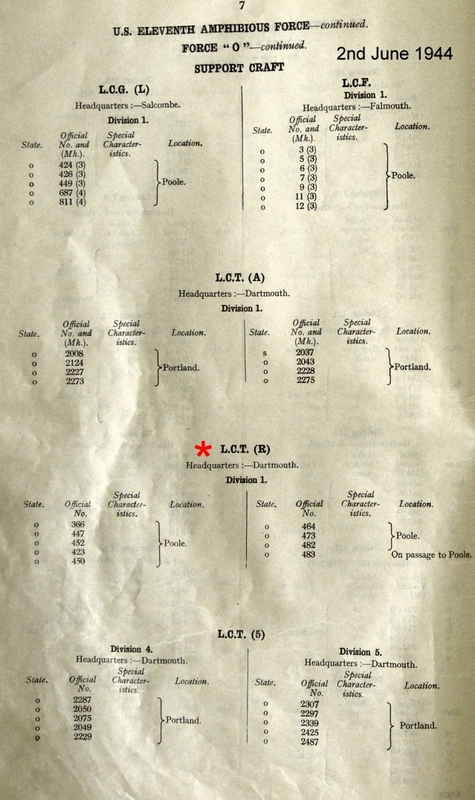 They were transcribed by Tony Chapman, Official Archivist/Historian of the LST and Landing Craft Association (Royal Navy) and edited by Geoff Slee for publication on the Combined Operations website including the addition of maps, Imperil War Museum photos and extracts from the Admiralty's 'Green List' of landing craft dispositions.